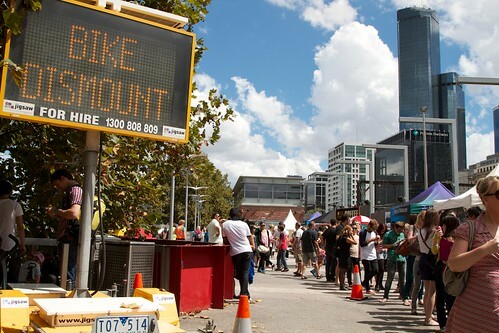 Melbourne food & wine festival: the Food Truck Jam! In my post about a trip to Gumbo Kitchen a while ago, I wrote about how on a holiday to New York last year Gerard and I went to two food truck rallies including the first annual Zagat Food Truck Frenzy which featured 26 food trucks along two closed off blocks in Manhattan. It was one of my all time favourite food experiences, the atmosphere and the food just combined to create something really special. Ever since then I’ve been wishing that something similar would happen here, so you can imagine how excited I was when I heard about the MFWF’s Food Truck Jam – 2 days, 7 trucks each day, brilliant! We went on Sunday which turned out to be the better weather pick. If anything, it was too warm. I took an umbrella, but would have been better off packing the sunscreen. 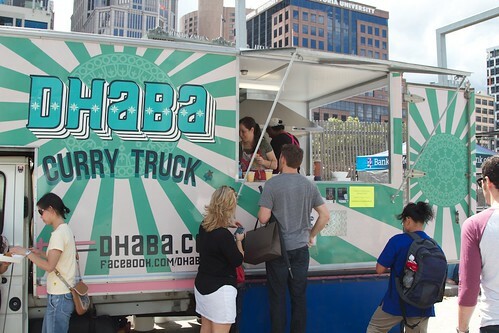 On Sunday the Food Truck Jam featured Dhaba (a curry truck), Cornutopia (grilled corn, nachos), Massive Wieners, the Taco Truck and Beatbox Kitchen. We tried the last three. I also really wanted to try Dhaba, but sadly our stomachs just weren’t up to the challenge of 4 trucks in one meal. Next time we’ll have to plan ahead and not eat anything for at least a day before hand. 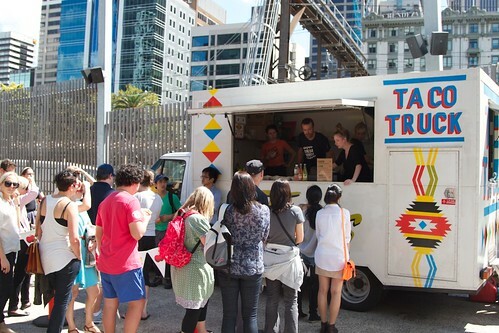 The Taco Truck and Beatbox Kitchen are both normally around Northcote and nearby suburbs for dinners and weekend lunches, you can follow them on twitter to see upcoming locations. Cornutopia lives at Preston Market and Dhaba lives all the way away in Woodend. 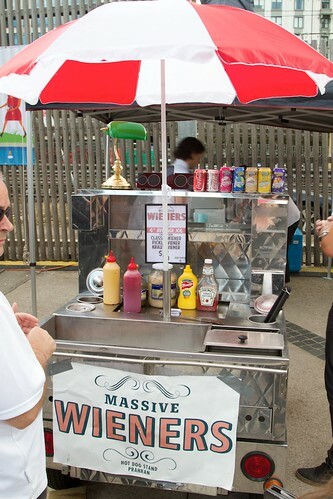 Massive Wieners isn’t a food truck as such, more like a portable stand where you’re served hotdogs by guys wearing bow ties, just the way hotdogs should be. There’s been a lot of buzz about this new comer to the mobile-food scene. And yes, by buzz I just mean a lot of people snickering at the name. From what I could tell, people talking about the name made up about 30% of the conversations at the Food Truck Jam (at least another 30% was people talking about how long the Taco Truck line was). So, is there more to Massive Wieners than a name that makes people with the maturity of a 7 year old boy (like me) laugh? I think so. They also have a permanent shop front at 113 Greville Street, Prahran. In the shop they sell 3 sizes of hot dogs (12 inch, 6 inch and 3 inch) with a variety of toppings. A word of warning though, if you’re planning to visit in Prahran, I would check their facebook first to make sure that they’ll actually be there – Gerard and I tried to go a couple of weekends ago and after confirming opening hours on the website were a bit annoyed to find the shop closed with a note taped to the window saying that they were in Sydney for the weekend serving at some event. Hopefully one day they’ll get to the point where they have enough staff that they can serve at events and keep their shop open. I let out a little squeal when I saw on the Melbourne Food & Wine app that there was going to be a food truck event at this year’s festival. 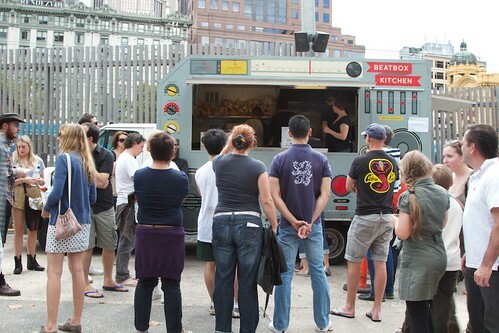 Although I’d been to Beatbox Kitchen at Golden Plains, I haven’t had the chance to sample any Melbourne Food Trucks in their native environment. Unfortunately, daydreaming about standing on Ruckers Hill eating a taco from @tacotruckmelb isn’t the same as actually doing it. The BOM said the weather was good, and when we arrived we unfortunately discovered it was a little too good. The northern bank of the Yarra, near the Signal Youth Centre, was radiating that childhood-summer heat that’s been missing all summer. It certainly wasn’t jeans and a black t-shirt weather, and I was more than sweltering by the end of it. The most surprising thing about the event for me was that it didn’t seem that busy. Yes the queue for the Taco Truck, which was by far the most popular, was 30 minutes or more at times, but there were plenty of smaller lines at some of the other trucks. I was expecting it to be overrun with Melbournians wanting to soak up the last of the sun’s rays while nibbling on some gourmet portable food. Not that those shorter queues are a bad thing, but with the rate new trucks are coming onto the scene, I don’t think next year’s event will be so leisurely. Viva La Truck! From Massive Wieners we shared a massive (12 inch) kraut wiener, with white onions, ketchup, mustard, sauerkraut and cheese ($7 for the hot dog, $1 extra for the cheese). 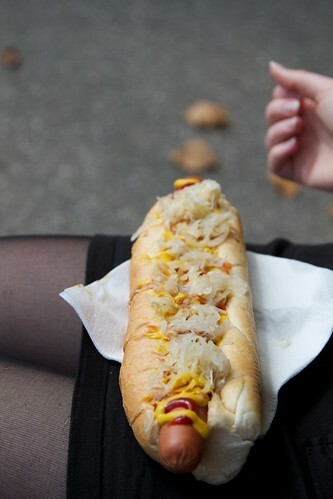 The kraut wiener is also available in 6 inch ($4.50) and 3 inch ($3.50). 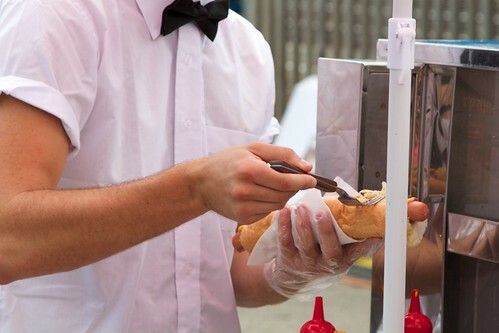 Now this isn’t a fancy, gourmet sausage a la Snag Stand, it’s just your average hotdog. And you know what, sometimes that’s exactly what you want. The hotdog was exactly what you expect a hotdog to be, the toppings and the bun were good and the price was pretty reasonable. See above for details of Massive Wieners’ permanent shop in Prahran. From taco truck, we ordered a taco plate – 2 tacos and corn chips ($12). 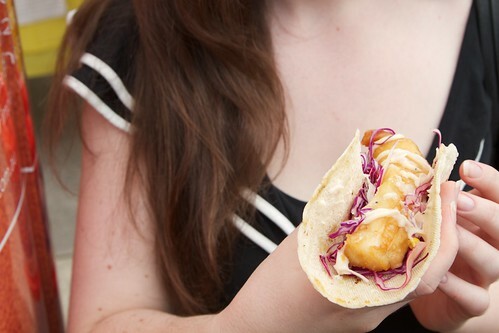 Gerard went for a chicken taco and I had the fish. 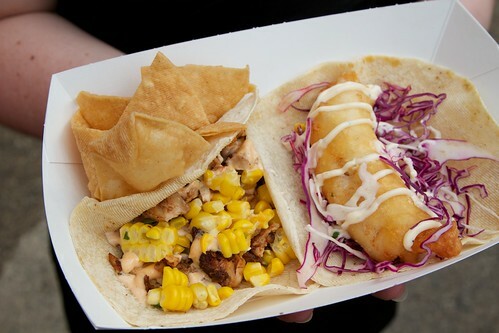 I really enjoyed the fish taco, the fish was just crispy enough and the tortilla tasted relatively fresh. 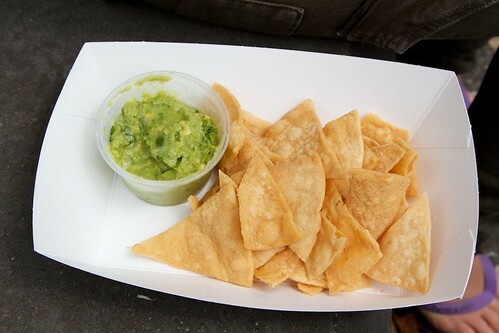 One of our friends also generously shared her serve of corn chips with guacamole ($5). These were probably actually our highlight for the day, the chips and guac were both perfect. 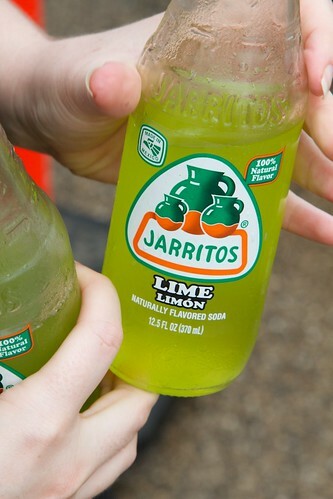 Oh, and we also had a couple of Jarritos mexican soft drinks ($4 each). I’ve become pretty obsessed with these lately, if you’re looking for them I’ve also found them on the menu at Fonda Mexican, Trippy Taco, Paco’s Tacos and HighTech Burrito on Glenferrie Rd. Finally from Beatbox Kitchen we split a Raph burger that comes with lettuce, cheese, tomato, onion and stereo sauce ($11). We also had a side of fries with stereo sauce ($5). The burger (which was featured in Epicure’s burger article yesterday) was tasty. Not the best burger I’ve ever had, but pretty good for something cooked in a truck. The burger is a little on the small side, but that may actually be a good thing given that it means it’s just the right size to hold in one hand, perfect for a mobile meal. That said, at $11, it’s one of the more expensive burgers by volume getting around. Good food and a bit of fun, catch these trucks if you can. 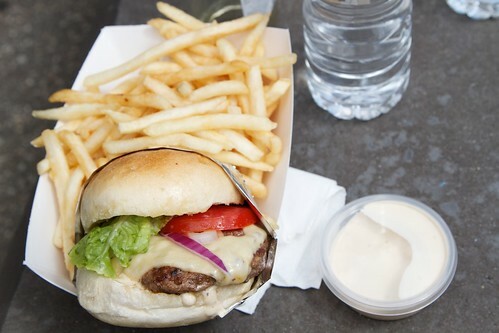 This entry was posted in Eating out and tagged CBD, food trucks, Melb food & wine festival. Bookmark the permalink. Trackbacks are closed, but you can post a comment. Raph Burger on the small size? You must have a huge appetite as they are 180g of pure ground beef?